Patricia Turner AM, CEO of National Aboriginal Community Controlled Health Organisation (NACCHO), launched the Annual Update on Monday 21 November 2016 at the RANZCO Annual Congress. The gap in blindness in Indigenous communities has been halved since 2008 through collective implementation of the sector-supported Roadmap to Close the Gap for Vision, according to a report launched today. 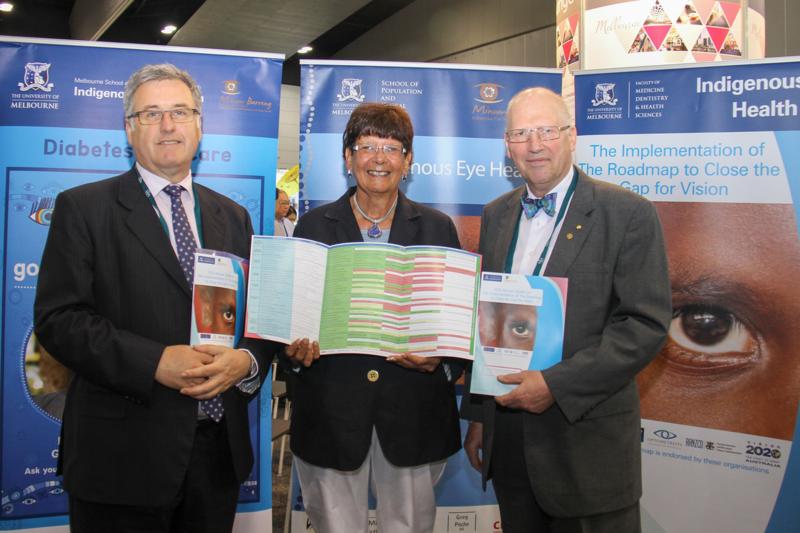 Speaking at the Royal Australian and New Zealand College of Ophthalmologists (RANZCO) Annual Scientific Congress in Melbourne, Laureate Professor Hugh R Taylor AC, Harold Mitchell Chair of Indigenous Eye Health at the University of Melbourne said that progress is being made on every single recommendation in the Roadmap to Close the Gap for Vision, which was developed by Indigenous Eye Health at the University of Melbourne. Eleven of the 42 recommendations have now been fully implemented, with almost two thirds of all activities completed. “In terms of regional implementation of the Roadmap, there has been positive engagement. We are working with 18 regions across the country covering almost half of the nation’s Indigenous population,” Professor Taylor said. “We can report that at the beginning of this project, we found rates of blindness and impaired vision were up to six times higher than for non-Indigenous populations. This has now been halved,” he said. “While the rate stands at three times more than the national average, this is still a very encouraging improvement. With on-going national support, we are determined to reach eye health parity with the rest of the Australian population. of the National Aboriginal Community Controlled Health Organisation (NACCHO). In his role as Chair of Indigenous Eye Health, Professor Taylor is also working with Indigenous leaders, partners and members of the community in a mission to eliminate trachoma in Australia. “We are the only developed nation with endemic disease and only in Indigenous communities. Many Indigenous communities are now trachoma free and we can turn our attention to other main causes of blindness and poor vision in Indigenous communities: cataract, refractive error and diabetes,” Professor Taylor said.